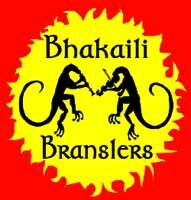 The Bhakaili Branslers are an SCA band founded late in 1990, specifically to play dance music for SCA events. The name derives from the original home barony of the group, the Barony of Bhakail, located in Philadelphia, PA and its immediate surroundings, and from a type of 16th century French dance called a Bransle (pronounced "brawl"). It has grown from a intimate local group into a fairly large and well-respected troupe playing from Richmond, VA to Albany, NY and everything inbetween. The present schedule is listed below. If you are interested in having the Branslers play an event or show up somewhere, please contact the director, Sabine de Kerbriant in the Barony of Bhakail. She can be reached at SabineKdL at yahoo dot com. 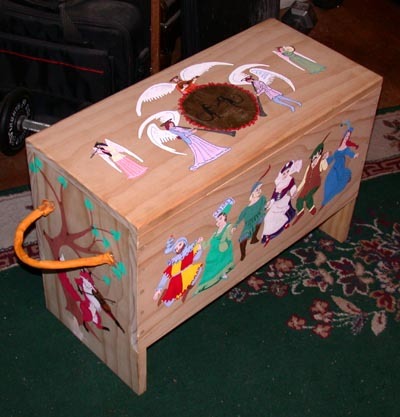 Originally conceived and organized by Gaston D'Amberville to play music for the Kingdom level 12th Night event occuring in January of 1991, as a ball had been scheduled for that event. The original members of that first troupe were Gaston D'Amberville on percussion, Arden on harp, Sela on cittern/guitar, Beryl on soprano recorder, and Grainne I on soprano/alto recorder. We didn't have any music at the time, so Arden scrawled out a few random arrangements with chords for the most popular dances of the time. These included Gathering Peasods, Black Nag, Black Alman, Heart's Ease, Rufty Tufty. Photocopies of these original handwritten pieces are still floating around somewhere (actually one or two have showed up at practices even this month!)... We had regular practices until we were somewhat passable, and then played for the event. The endeavor proved a success, and so we began. Several other players were fairly quickly acquired. Yaacov on soprano, sopranino recorders, Kriemhild on hammered dulcimer and soprano recorder joined with the regular practices at Rocco and Kiera's archery Sundays. The repetoire continued to expand, and we actually started playing several local events. The group even did a couple of demos at the Philadelphia Art Museum, where we played in the medieval galleries (rather nice). The first real Branslers heyday saw the increased addition of Cynon on guitar and recorder, Sabine on flute, Galen on percussion and hammered dulcimer, Gwen on trombone, Kirsten on flute and guitar, and Solomon on recorder, harp or bagpipe. We played a large number of events in the area and beyond and actually started to get something of a reputation. As Gaston's health deteriorated (he had a heriditary immune deficiency disease), Kriemhild took over administrative control of the group and we prospered for quite a while into the 90's. In the mid-90's a number of things broke up the group for a while. Gaston passed on, Kriemhild moved to Virginia (and ultimately to the Carolinas), Sela moved to Wales (and then to England), Grainne's and Beryl's lives got complicated forcing them to withdraw, and Arden moved for one academic year to Toronto ('95). Galen moved to Michigan, and due to various factors, the Sunday archery/music practices stopped. 'Twas a dark time for the Branslers! But slowly we re-emerged from the darkness with some bolstered numbers. In late '95, the Branslers returned now with Arden (who had switched to lead fiddle from harp), Cynon, Sabine, Yaacov, Solomon, Isabeau I on recorder and hammered dulcimer, Julianna on violin and flute, Cluaran on recorder and various percussion, with periodic guest appearances from Kirsten, Gwen and Kriemheld when they were available. Grainne I eventually found her way back into the midst, and we variously acquired Ken Ruh (on flute and harp), Jannequine (on recorder and lute), and several others who drifted briefly in and out. It is in this incarnation that we started on the circuit of events that we tend to play now, including Bhakail Yule, Barren Sands Mistletoe, Nordenthal's Sign of the Dancing Fox, and others. Trips to Virginia to play for events in Atlantia also occurred, as well as schleps up to Albany, out to Rhode Island, Ithaca, and other more far flung places. A second major restructuring occured at the end of the 90's. Solomon and Beryl's actual lives got very complicated and they reduced themselves to "mystery bransler" status. Joyce moved south to Atlanta, Angela got married and work life overtook her existance. Ken Ruh started playing more with Markland than with the SCA. The group got pared down practically to Arden, Cynon, Grainne, Sabine and Yaacov, with occasional appearances by Jannequine, Julianna, Cluaran and Kirsten. Next, the Branslers had a re-building trend again. Jannequine solidified as a more regular member (despite her physical distance from the group) as did Kirsten. We added Grainne II on percussion, Siobhan on recorder and harp, Giannotta on guitar and sometimes percussion, Ken the Glass Painter (different Ken than above) on percussion, our patron baroness Dorren and her husband Edward on percussion, Robin on hammered dulcimer, Erlan (on recorders, also from a fair distance north) and have some other potentials in the wings. We continued to play events on an ever increasing basis, and had recently been awarded (as an ensemble) the Golden Lyre and the Queen's Order of Merit by the East Kingdom royalty for excellence in the arts. 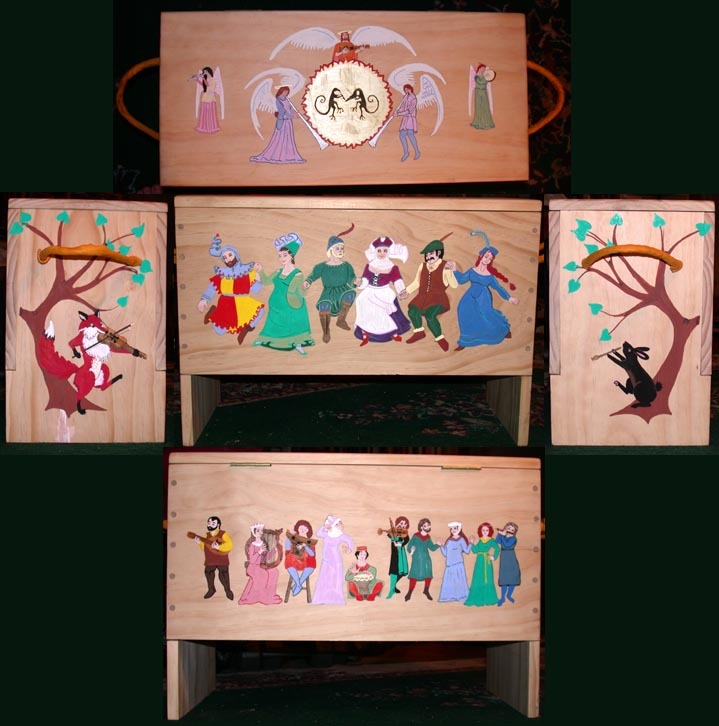 Arden got his Laurel which was a very pleasant surprise, and the kind peoples at our favorite annual event, Sign of the Dancing Fox gave us a beautiful painted box, pictures of which can be found below. As we were regularly playing a couple of northern events, several of the northern musicians started playing with us rather regularly while we were up there, including Marcellus (on violin/viola), Pat (on violin), Eve (also on violin -yes, it's a trend), Deanna (on various winds, but mostly recorders) and Isabeau D'Orleans (different one than earlier Isabeau, on recorders and percussion), and Rose (Marcellus' wife on flute and percussion). Presently we're going through another restructuring phase, as peoples lives shift yet again. Solomon, Beryl, Grainne I, and Robin all have children now (in all but Robin's case multiple children), which has, as it tends to, cut into their free time. Dorren and Ed are in plans to move to Hawaii at the end of 2007, so we will soon be losing them. Ken has been around a lot less (partially due to overseas travel and lots of work). Cynon and Grainne II had a number of health problems this past year which limited their participation recently, though that hopefully will be improving in the future as their health improves. Julianna has more or less left the SCA, so she is no longer around. Other people, including Rufina and John Bloch have periodically joined in to help fill out the ranks as necessary, and we are somewhat again in an active recruiting phase. Sabine has taken over as Director starting in March 2007, with more information to come! Arden: person who posts music, active. Various fiddles, harp, recorders, percussion, various others as he picks them up or builds them. Cynon: active. Guitar, octave mandolin, mandolin, violin, percussion, recorder. Dorren: active. Percussion (mostly tabor drum). Erlandr: active. Recorders and periodic percussion. Grainne I: active. Soprano/alto/tenor recorder, pennywhistle. Grainne II: periodic. Percussion (mostly bodhran). Jannequine: active. Bass/tenor recorder, lute. Ken the Glass Painter: periodic. Percussion (mostly djembe). Kirsten: periodic. Flute (modern and Irish), pennywhistle, periodic percussion. Robin: active. Hammered dulcimer, flute. Sabine: active. Present director. Renaissance and wooden keyed flutes, percussion, various reeds. Yaacov: periodic. Concertina, soprano/bass recorder. Saturday, December 7, 2002. Barony of Bhakail. Playing for I Sabastiani performance and evening dancing. Saturday, December 14, 2002. Barony of Barren Sands. Playing for afternoon entertainments and evening dance. Saturday, January 11, 2003. Shire of Hartshorn Dale. Playing for evening dancing. Saturday, February 8, 2003. Shure of Nordenhall. Playing for dance all day long! Saturday, February 22, 2003. Shire of Long Island. Playing for evening dancing. Saturday, March 8, 2003. Shire of Hartshorn Dale. Playing for evening dancing. Sunday, May 25, 2003. Shire of Hartshorn Dale. Playing for evening dancing. Saturday May 30, Sunday June 1, 2003. Barony of Carillion. Playing/demoing throughout the day. Saturday-Monday, Oct. 10-12, 2003. Darlington, MD. Playing for dancing and various entertainments. Saturday November 1, 2003. Barony of Bhakail. Playing for evening dance. Saturday, November 15, 2003. Shire of Iron Bog. Playing for dancing and various entertainments. Saturday, December 6, 2003. Barony of Bhakail. Playing for dancing and various entertainments. Saturday, December 13, 2003. Barony of Barren Sands. Playing for dancing and various entertainments. Saturday, February 9, 2004. Shire of Nordenhall. Playing for dancing all day! Saturday, March 13, 2004. Shire of Hartshorn Dale. Playing for evening dancing. Saturday, April 3, 2004. Barony of Settmour Swamp. Playing for evening dancing. Friday, April 30 and Saturday, May 1, 2004. Canton of Gleann na Feorag Dubh Playing for evening dancing. Saturday, May 22, 2004. Shire of Buckland Cross. Playing during the day. Sunday, May 30, 2004. Shire of Hartshorn Dale. Playing for evening dancing. Saturday, June 26, 2004. Shire of Hartshorn Dale. Playing for evening party. Saturday, July 17, 2004. Barony of Bhakail. Playing background music for the evening reception. Saturday, July 23, 2004. Eisenthal. Playing for court and evening dance. Saturday, September 11, 2004. Barony of Bhakail. Playing for evening dancing. Saturday, October 9, 2004. Darlington, Maryland. Playing for afternoon and evening dancing. Saturday, November 13, 2004. Rusted Woodlands. Playing for evening dancing and misc. background music. Saturday, December 4, 2004. Shire of Iron Bog. Playing for afternoon and evening dancing and misc. background music. Saturday, December 11, 2004. Shire of Barren Sands. Playing for afternoon and evening dancing. Saturday, December 11, 2004. Barony of Bhakail. Playing for evening dancing. Saturday, February 5, 2005. Shire of Nordenhall. Playing for afternoon and evening dancing. Saturday, February 12, 2005. Barony of Bhakail. Playing for afternoon and evening dancing. Saturday, March 12, 2005. Shire of Hartshorndale. Playing for afternoon and evening dancing. Saturday, April 2, 2005. Shire of Rusted Woodlands. Playing for court, misc. background, and dancing should it occur. Sunday, May 29, 2005. Shire of Hartshorndale. Playing for evening dancing. Friday, June 3, 2005. Barony of Bhakail. Demonstrating various Elizabethan style instruments and music. Saturday, September 24, 2005. Barony of Settmour Swamp. Playing for court and misc. background, and dace should it occur. Saturday, October 8, 2005. Darlington, Maryland. Playing for afternoon and evening dancing. Saturday, October 29, 2005. Shire of Iron Bog. Playing for afternoon and evening dancing. Saturday, November 5, 2005. Barony of Bhakail. Playing for evening concert, and misc. throughout day. Saturday, December 3, 2005. Barony of Bhakail. Playing for evening dancing. Saturday, December 10, 2005. Shire of Barren Sands. Playing for afternoon and evening dancing. Sunday, December 18, 2005. Barony of Bhakail. Providing some period music accents for holiday church service. Saturday, January 21, 2006. Barony of Carillon. Playing for evening dancing. Saturday, February 4, 2006. Shire of Nordenhall. Playing for evening dancing. Saturday, February 24, 2006. Shire of Nordenhall. Playing for evening dancing. Saturday, March 11, 2006. Barony of Concordia of the Snows. Playing for afternoon and evening dancing. Saturday, March 18, 2006. Barony of Iron Bog. Playing for evening dancing. Sunday, May 28, 2006. Shire of Hartshorndale. Playing for evening dancing. Friday, June 2, 2006. Barony of Bhakail. Demonstrating various Elizabethan style instruments and music. Sunday, September 17, 2006. Wheaton Village in Millville, NJ - playing music throughout the day. Saturday, September 23, 2006. Barony of Iron Bog. Playing for afternoon and evening dancing. Saturday, October 7, 2006. Darlington, Maryland. Playing for afternoon and evening dancing. Saturday, December 2, 2006. Barony of Bhakail. Playing for evening dancing. Saturday, December 9, 2006. Shire of Barren Sands. Playing for afternoon and evening dancing. Saturday, January 20, 2007. Shire of Owlsherst. Playing for afternoon and evening dancing. Saturday, February 3, 2007. Shire of Nordenhall. Playing for afternoon and evening dancing. Saturday, March 10, 2007. Barony of Concordia of the Snows. Playing for afternoon and evening dancing. Saturday, March 24, 2007. Barony of Settmour Swamp. Playing for evening dancing. The Mighty Branslers Box! Created by Alayne and Seraq from Nordenhal. Its about 18x12x30 inches or so. The Dancing Fox (with fiddle) refers to the "Sign of the Dancing Fox" which is the event at which this was given. The black rabbit refers to my dwarf rabbit Thistle (her page is here). The dancers and players refer to the large dancing event which we annually play.